Crowd Pleasing Chicken | I Am Not A Restaurant! After asking 5 children 16 to 26 for their thoughts on dinner, I got chicken. And so did they. Doubling the recipe took a little extra time, but chicken piccata is a great weeknight option. I also only used one pan, cooking the chicken in batches and keeping it warm in the oven. At the end I threw it all back in the sauce with no one the wiser. No pressure, but I served it with pasta in vodka sauce. Recipe to come. Click here for the chicken recipe, courtesy of Epicuriois. 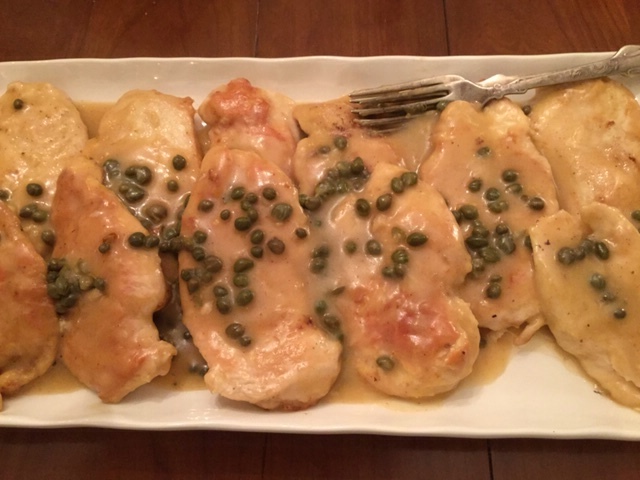 Mar17March 17, 2015 • By Betsy Karetnick • This entry was posted in Chicken, Dish of the Day, Kitchen Help, Recipes and tagged chicken, chicken piccata, epicurious. Bookmark the permalink.